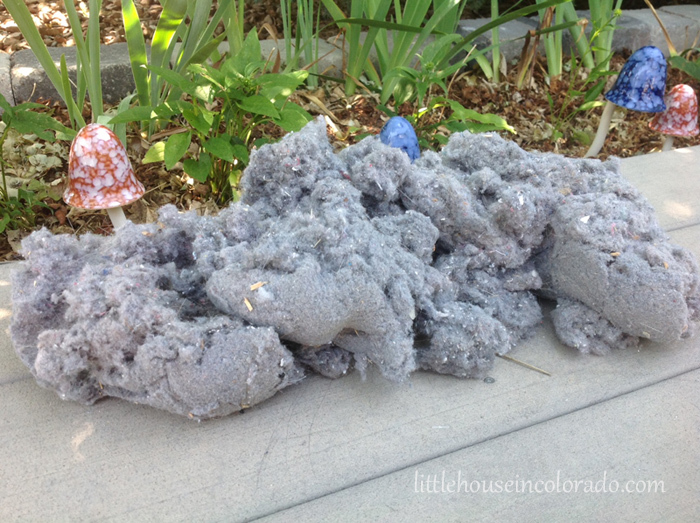 Last month in my organizing tips, I mentioned the surprising amount of lint we blew out of our dryer vent last summer. I wanted to go a bit more in detail about that since it was so unexpected and really changed our maintenance routine (and let's not forget that dryer lint is a huge fire hazard). According to FEMA, "2,900 home clothes dryer fires are reported each year and cause an estimated 5 deaths, 100 injuries, and $35 million in property loss. Failure to clean the dryer (34 percent) is the leading cause of home clothes dryer fires." Our dryer vents are really long - a serious design flaw in the house. Last summer, our dryer started taking longer to dry - to the point that we considered calling a repairman. One afternoon, Mr. LH and I pulled out the dryer (no small feat in our tiny laundry space). We detached the vent hose from the dryer and vacuumed out the dryer exhaust and the end of the hose. I also went outside to clean out that side of the vent. While we were standing there with our dryer pulled out and the vent opening exposed, I suggested we use our leaf blower to force air into the dryer vent, hopefully to blow out any extra lint that might be clinging to the sides of the vent (we had done this in our other homes in the past with some success). What resulted shocked us. After only a few seconds of directing the leaf blower into the vent, a HUGE cloud of lint exploded out the vent and deposited a massive lint pile into our back yard! We clean our lint trap after every cycle. I also run a long lint catcher (you can use a Swiffer Duster) into the lint area regularly to collect any loose lint, regularly wash the screen AND make it a point to check the outside exhaust to be sure there is no build-up. I didn't expect to have so much lint built up INSIDE the vent! There is no telling how ling this had been building up. We had already lived in the the house for two years at the time and didn't have furry pets (now the Girl has a guinea pig) but the lint had dog or cat hair in it. It's possible the dryer vent had NEVER been fully cleaned out. 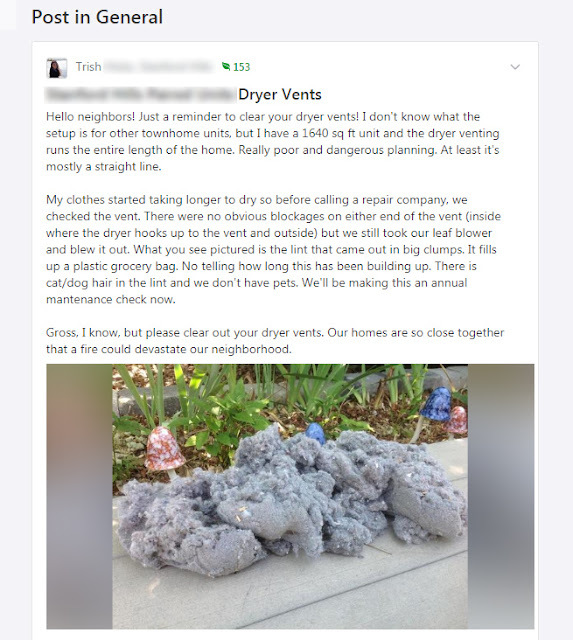 Anyway, I was so surprised by the shear amount of lint that I posted the photo, along with a public service announcement, on NextDoor for my neighbors to see. One neighbor mentioned she experienced a fire in her childhood home because of dryer lint. Another neighbor, with the same floor plan as ours, was so alarmed by this that she tried using a leaf blower. When nothing came out of her vent, she went down to the crawl space and disassembled her dryer vent. She said there was a HUGE clog. Her vent was so packed full of lint that the forced air from the leaf blower could not get through it or move it. And with every use of the dryer, the situation got worse. It was a huge fire hazard. I am so thankful she was able to clear her dryer vent! Clean those vents. No joke. We have added "Blowing Our the Dryer Vents" to our regular 6 month maintenance plan.